Are you happy with your current ICT support provider? We guarantee to beat it! 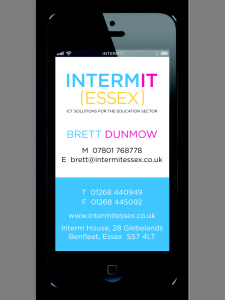 Interm IT (Essex) offer regular, face to face, onsite, technical support to many schools in your area. We have technicians working in Essex, Suffolk, Thurrock, Greenwich, Kent. Our company supports all types of systems ranging from Ergo F2T, RM Connect, Ranger etc. There is no fixed term contract and a complete PAYG service for all schools. We believe we are one of the least expensive companies of its size in the area, so why not take advantage of a FREE two hour visit to your school and see why so many schools choose Interm IT (Essex)? We believe that we are one of the largest companies of its kind in the country, however, we still maintain a family-oriented feel. And no contracts to bind you to a company that you are not happy with. Our price includes all levels of ICT support – nothing hidden.